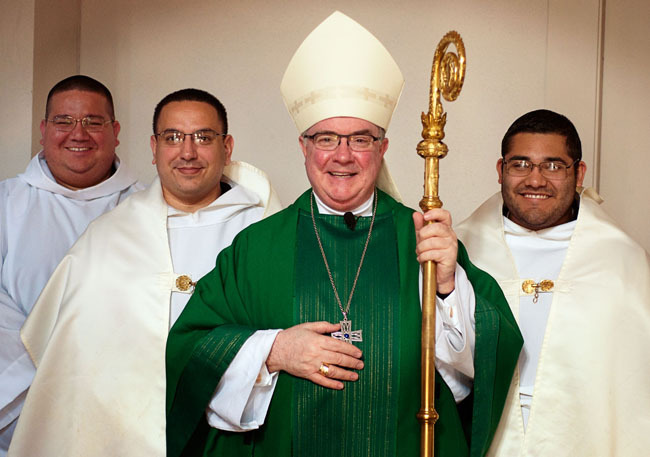 Seminarians, from left, Ramiro “RJ” Regalado, Richard Gutierrez and Charles Silvas served Mass with Bishop Mulvey at St. Joseph Seminary. Not pictured are Oscar Chaparro and Margarito Trevino. This week I had the opportunity and pleasure of visiting our five seminarians at St. Joseph Seminary in Louisiana. I celebrated Mass for the seminarians and shared with them some thoughts about where we as Catholics go from here after the recent elections. I said that we are not people who encamp ourselves causing divisions amongst people, if we believe in Christ. The Gospel readings were appropriate to this topic and I am glad to share them with you below.